With complex documents that have many objects, your work area can be become cluttered, making it difficult to work easily on individual elements without inadvertently moving or changing nearby elements. Layers can be used to restrict the amount of detail shown at any one time by locking or hiding objects you don’t want to move or change, thus making it easier to work on one particular area of your document. Using layers you can group a collection of items together into a named layer and then turn the whole collection on or off (make it visible or hidden) with a single click in the Page & Layer Gallery. 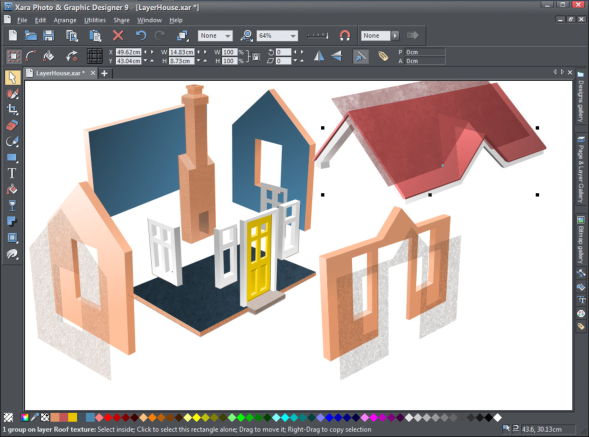 Download the trial versions of Xara Photo & Graphic Designer or Designer Pro and the layerhouse document file and I will show you how easy it is to work with layers using this example of a house drawing where various parts have been grouped together on layers.